The Republic of South Sudan gained independence in July 2011 from Sudan after over 40 years of running civil wars. Geographically, South Sudan is approximately the size of The State of Texas, and it has a population of approximately 12 million, which mostly lives in the rural areas. The little civil infrastructure left after Sudan's independence in 1955 was destroyed during the civil wars impacting service delivery especially in the medical sector. The immense demand of qualified medical professional can not be met overnight, and sustainable delivery of medical services can only be achieved by investing in South Sudanese talents. 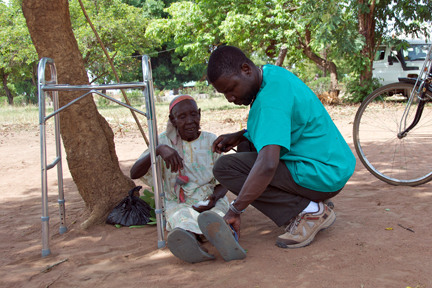 The Healing Kadi Foundation has been providing health care services to the population in Kajo Keji, South Sudan since 2007. The lack of medical infrastructure often meant serving the patients under mango trees or local school grounds. Please contact us to learn how you can support our team.